Associations for the restriction of competition in the production and distribution of commodities. From the twelfth century onward most of the towns of western Europe were organized in such a manner as to restrict each craft and trade to the control of a close corporation, which determined the conditions under which men were allowed to work, to sell goods, etc. As a rule, gilds were intended for charitable, social, and religious purposes. According to Schanz ("Zur Geschichte der Deutschen Gesellenverbände," p. 69), they were modeled on the church fraternities, and invariably included arrangements for church festivities. The merchant and craft gilds of England were also organized for common worship (Ashley, "Introduction to English Economic History," i. 91), especially to provide for masses and vigils, to furnish candles, and to perform other duties on the occasion of the death and burial of any of their members (ib. 92). In no case might Jews be admitted to these confraternities. Thus at Florence, among the seventy-three organizations enumerated by Doren ("Entwicklung und Organization der Florentiner Zünfte," pp. 205-207) none would admit any person that had not received the freedom of the city, a privilege which was denied to Jews. Similarly, in London no "foreigner" (that is, a person not born in the liberty) might be received in the city or might trade there (Ashley, l.c. ii. 89). Only a member of a craft gild might manufacture goods; none but a member of the gild merchant might sell them. 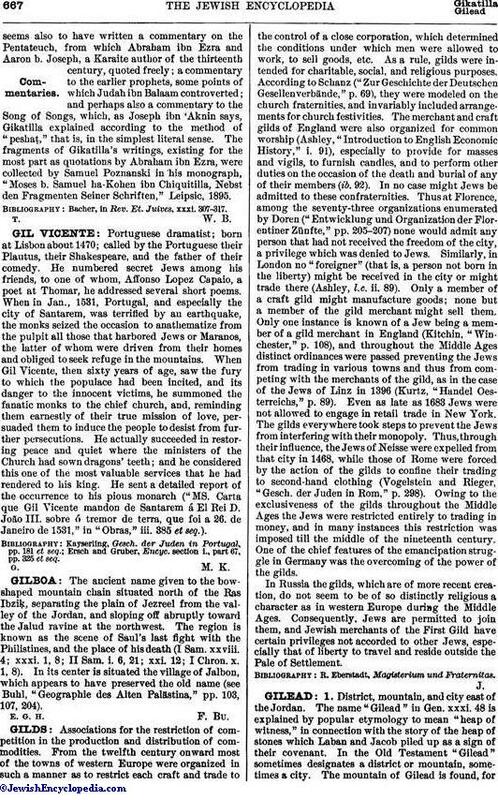 Only one instance is known of a Jew being a member of a gild merchant in England (Kitchin, "Winchester," p. 108), and throughout the Middle Ages distinct ordinances were passed preventing the Jews from trading in various towns and thus from competing with the merchants of the gild, as in the case of the Jews of Linz in 1396 (Kurtz, "Handel Oesterreichs," p. 89). Even as late as 1683 Jews were not allowed to engage in retail trade in New York. The gilds everywhere took steps to prevent the Jews from interfering with their monopoly. Thus, through their influence, the Jews of Neisse were expelled from that city in 1468, while those of Rome were forced by the action of the gilds to confine their trading to second-hand clothing (Vogelstein and Rieger, "Gesch. der Juden in Rom," p. 298). Owing to the exclusiveness of the gilds throughout the Middle Ages the Jews were restricted entirely to trading in money, and in many instances this restriction was imposed till the middle of the nineteenth century. One of the chief features of the emancipation struggle in Germany was the overcoming of the power of the gilds. In Russia the gilds, which are of more recent creation, do not seem to be of so distinctly religious a character as in western Europe during the Middle Ages. Consequently, Jews are permitted to join them, and Jewish merchants of the First Gild have certain privileges not accorded to other Jews, especially that of liberty to travel and reside outside the Pale of Settlement. R. Eberstadt, Magisterium und Fraternitas.